Do you want to quickly create multiple folders with specific names? Besides using quick shortcut key to create folders on Windows, you can automate this routine using free portable utility “Text 2 Folders”. It allows you to batch create folders with names mentioned in specific text file at a click of a button. 1. Download Text 2 Folders utility. Unzip the downloaded file and double click to launch the program. 2. Click the select any foot folder on the computer. All new folders will be created automatically within root folder. 3. Then select text file containing names that should be assigned to each folder generated within root folder. 4. Click “Create Folders” button. 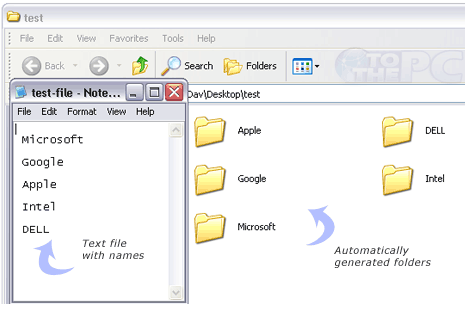 Multiple folders will be created in root folder with names taken from contents of selected text file. Quick and easy way to make custom named folders in batch mode. My program is multi creating folders with different uses than Text2folders .. Thanks a lot, I have created 26,900 folders in a few hours. that must be Tiring Writing the Names of all of them. expect that its more tiring without this T2F program. Thank you so much for this! I have at least 350 folders I need to create. This saved a lot of time and effort! This little tool is $#*%ing awesome! I created 104 folder in 5 seconds!